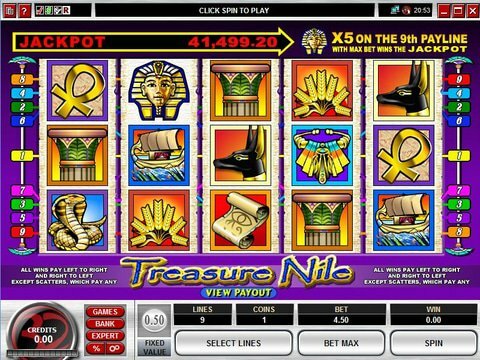 The Treasure Nile slot machine from Microgaming offers up a colorful Egyptian theme that is spread out over five reels and nine paylines. It's an older game, but the progressive jackpot ensures its endless popularity. You can review it right here on this page with the Treasure Nile free play slot demo we've made available to you with no download and no registration, and this will let you figure out whether you're ready to spend your real money trying to win the progressive jackpot. You can sample it from any Flash-enabled computer or mobile device. The progressive jackpot is quite nice, but so are the features even if they are very limited. You can access everything with a betting range that starts at just a nickel and climbs to a modest $4.50. The Sunset acts as the wild and will finish winning combinations, but there is no multiplier associated with it. The scatter is the Scarab, and it pays any when you see two or more on the screen. There are no other special features like free spins or bonus rounds, but it is hoped that the progressive jackpot - known to pay out more than $300,000 - is enough to grab your attention. Of course, if you like feature filled gambling, you'll probably like Desert Kingdom from Genesis even more. The graphics are incredibly realistic, and the five reels are filled with animals that are commonly found in desert areas. There are plenty of features here, and the number of free spins you can receive (as well as their associated multiplier) is determined by the choices you make when you get a scatter on reels one, three and five on the same spin. Though this title also lacks a second-screen bonus round, it's still a better option if you are going to play for real money.